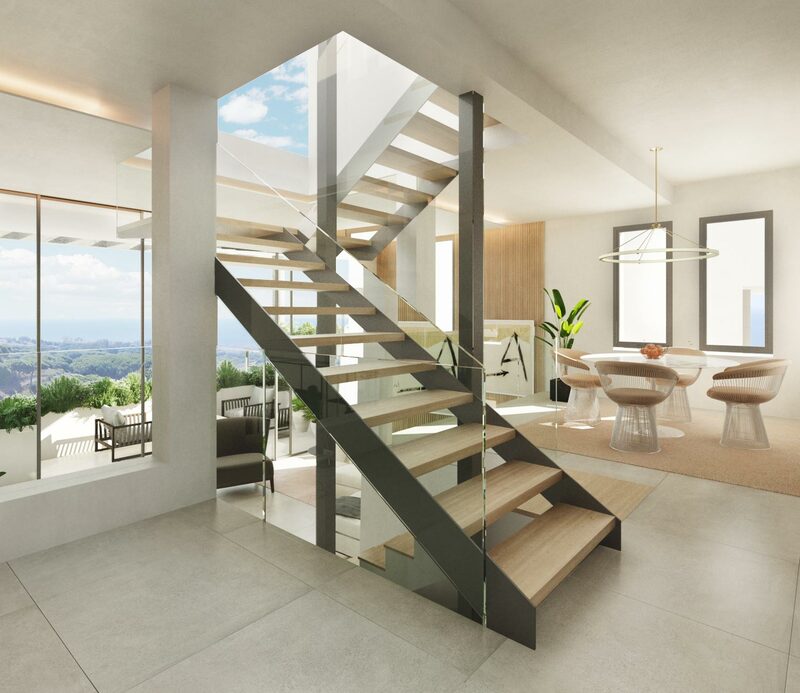 An innovative residential project in Cabopino. This seaside wonder is located in the municipality of Marbella (Malaga), one of the most beautiful spots in Costa del Sol. The properties are situated in a frontline golf property, with an excellent location as it is close to both a golden sand beach and the port. 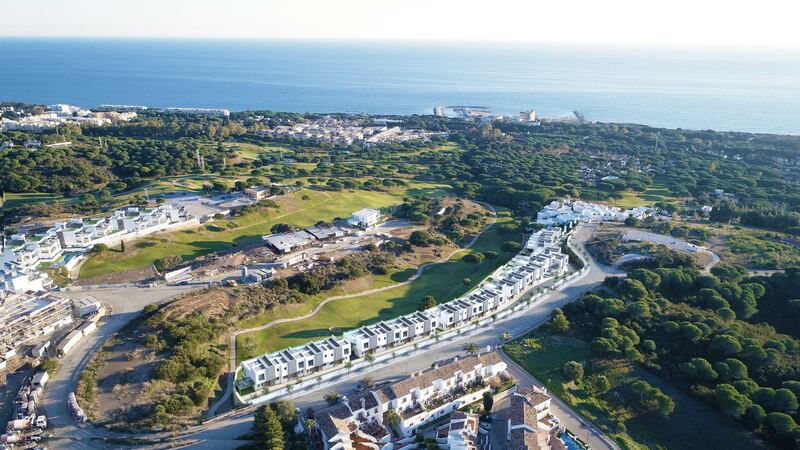 Located within the Cabopino golf course, making it a unique complex thanks to its awe-inspiring surroundings. A life in this privileged property is surely idyllic for golf lovers. Due to its enviable characteristics, Costa del Sol has become a top destination and now has the highest concentration of golf courses in Europe. Such is the popularity of the sport in the area, that it is now commonly known as ‘Costa del Golf’. Besides, this exceptional location by the Mediterranean Sea presents an average annual temperature of 20 degrees and over 320 days of sunshine a year. 'The Golf Coast' is thus a sure bet for both amateurs and professional golfers who want to practice at any time of the year. All our properties have three en suite bedrooms that offer wonderful views of the Mediterranean Sea. They also have a private swimming pool, a spacious terrace and sun terrace as well as wide private gardens to enjoy the brightness of the region. The living room is designed to ensure wellbeing and offers ease and elegance with a clear ceiling height of 3.60 metres. This architectural feature offers a very spacious and luminous space with numerous possibilities for decoration, to guarantee you a place of repose and leisure where to enjoy one of the most privileged areas of the world. The kitchen has been perfectly equipped with appliances NEFF, a brand that specializes in built-in kitchen devices. Both the flooring and bathrooms are provided by our partners from Porcelanosa, a leading company in the manufacture of ceramic floors and tiles. We also offer you the possibility to design the kitchen according to your own taste, with a wide range of choices and high-quality finish. And as part of the innovative design in our properties, we have incorporated Aerothermics, an efficient energy system that uses thermal energy from the air and feeds a cooling system in the summer and heating during the winter. Unlike other heating systems, the costs of maintenance are very low. The residential area offers absolute security and serenity, and surveillance cameras are installed to ensure the safety of your home. One of the most exclusive residential destinations in Europe, an ideal place to live the Mediterranean. The combination of sea and sun in these exceptional surroundings will offer all the relax and peacefulness that you were looking for, along with the pleasure of practicing your favourite sport. Thanks to its excellent location, you will easily find all services: sport centres, supermarkets, international schools, health centres, beach bars and restaurants, as well as commercial and leisure spaces. Besides, both the Malaga-Costa del Sol Airport and high speed train station are reachable within less than 20 minutes by car.